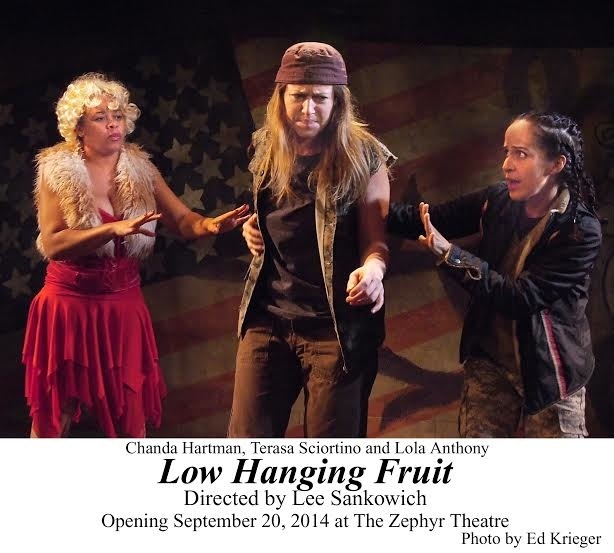 High Drama in Low Hanging Fruit | That Awesome Theatre Blog! A person that can be persuaded or manipulated with little effort is sometimes referred to as “Low Hanging Fruit,” an expression that suggests a person is metaphorically on the bottom, easiest to reach. 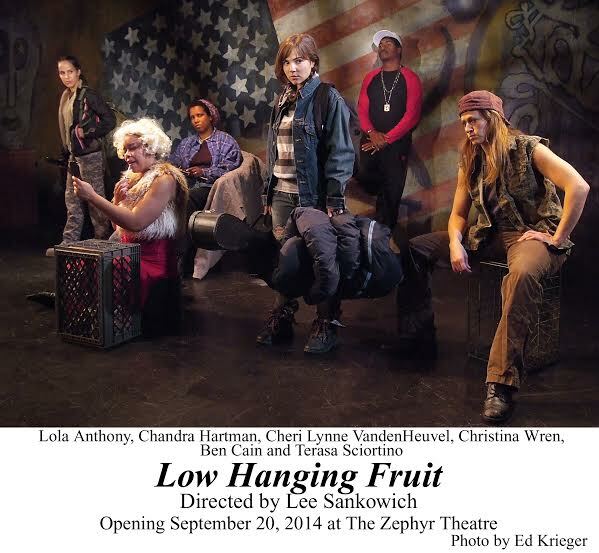 Playwright Robin Bradford uses this metaphor for homeless women veterans in her charged new play Low Hanging Fruit, making its world premiere now through October 26 at The Zephyr Theatre. These four women have created their own encampment, under the freeway, enclosed by fence, with a handmade cardboard sign that reads “Taj Mahal.” And they seem to trust and respect one another enough to allow their community to exist semi-peacefully. That is until a new element is introduced. Cory befriends a fourteen year-old runaway named Canyon (Christina Wren), and invites the child to stay with them in Taj Mahal. This new element immediately tests relationships, pushes boundaries, and raises painful memories. Each character takes her turn telling Canyon how she came to be where she is, and some of the horrors that she’s seen. Cory, in particular, who is desperate to make a lasting connection with Canyon, opens up to her and relates a story of war that is truly horrifying. It is a story that not only involves foreign enemies, but also a commanding officer, thus shedding a light on the vile treatment that some women have faced in the Armed Services. The play doesn’t do much to explain why these veterans are homeless, it’s simply a fact that we all accept without much persuasion. There isn’t outrage, no character rallies against the poor treatment of the returning women soldiers, but rather they accept it. It is this acceptance that makes the biggest statement. And so, as watch these women struggle, fight, and cling to some kind of hope for themselves, we are watching the reality that perhaps no one really cares. it’s a bleak message, and one that is reinforced over and over in this play. However, in the absence of societal action, these women draw strength, love, and empathy from each other. 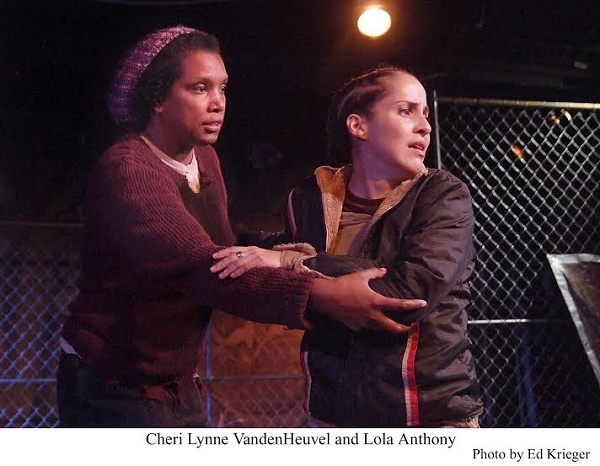 As the play moves forward, and each character is faced with possible life changes, whether it’s Cory’s budding relationship with Canyon, or Maya’s hope for getting off the streets and taking her girls with her, this play never relents from its central message, which seems to be: there is always hope, even when it seems the world doesn’t care. Isolating a huge issue like the poor treatment and rising numbers of homeless vets, and by containing the story in one community, allows for a certain amount of melodrama. Issue plays often skirt the line of didactic preaching, and representational hyperbole, and if the characters are authentic enough we can forgive them. That is the case here. Shifting episodically from moment to moment, this play never rests, and it is only during the poetic interludes that Maya speaks directly to the audience, that the tempo is at all relaxed. It is a charged play, to be sure, but one that is dealing with desperate characters in desperate times, so who can blame it? It has a lot to say, and it wants to say it all without actually saying it. However, it does use Maya’s poetry, which she reads out loud at an open mic night somewhere, as a way of directly addressing the issues of this play. But it is mostly through the conflicts, tensions, and eventual plot twists that speak for the issues of this play, and taken individually they can feel a bit overwhelming, but considering the subject, they actually work. Director Lee Sankowich knows what he’s doing with this play. He knows when to keep his actors still, creating near tableaus, so that when a character is thrust into a Post Traumatic panic attack, it’s as jolting for an audience as the characters in the play. He plays up the humor and tension as well, so there are explosive moments throughout, as well as laughs. The laughs often come at the expense of Yolanda, who is a bit of a stereotype. Chanda Hartman does a fine job of making Yolanda a genuine character, and she is good at getting the laughs, but she is slightly stifled by a series of clichés that hurt her credibility. As Cory, Terasa Sciortino has a difficult role, and she embodies her with grit and desperation. She is at once tough and fragile, and on the edge of collapse. Her quiet moments of reflection with Canyon are truly lovely, and she handles the PTSD with a prickly nervousness that turns into downright terror with superb control. Chrstina Wren and Lola Anthony, as Canyon and Maya, are both strong and each brings a unique and gentle touch to both roles. Ms. Wren creates an innocence in Canyon that benefits the character greatly, and Ms. Anthony’s poetry readings convey a sensitivity and vulnerability that change how we see Maya, especially in her interactions with the other women. Cheri Lynne VandenHeuvel, as Alice gives the most vivid performance of the night. She commands the stage with her authenticity and her humor, and her heartbreaking conviction. It is such a joy to witness an actor meld so completely into a role, as to make us forget we’re watching a performance. It is rewarding as an audience member to share in a characters catharsis, and with Alice we are richly rewarded. A worthy production of a worthy topic, shining a light on an overlooked truth. Low Hanging Fruit, is the kind of play that may be a bit overdone, a bit emotionally exhaustive, and perhaps a bit too obvious, but when you’re dealing with a topic that doesn’t have enough of a light shed on it, we should all be saying: Shine On!